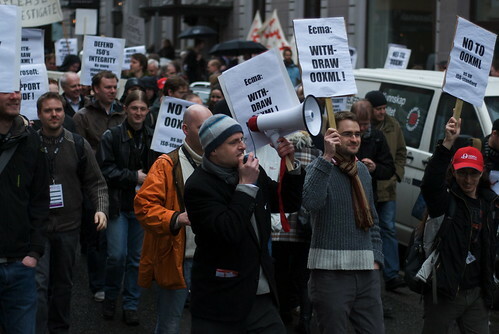 Forum » News / Front-page » OOXML triggers demonstration in Norway: "Let's throw OOXML out of ISO"
People were demonstrating today in Oslo in front of the ISO SC34 meeting against the adoption of Microsoft OOXML as an ISO standard, and especially against the behaviour of Standards Norway, who voted Yes to the specification, despite a lack of support by a majority of the technical committee. Friends, Bloggers, Free Coders, Supporters of Open Standards! We are not here today in order to bash Microsoft. We are here because we believe in open standards. We are not even here today because we are opposed to OOXML. We are here because we are opposed to OOXML as an ISO standard. We are not here because we want to discredit the ISO. 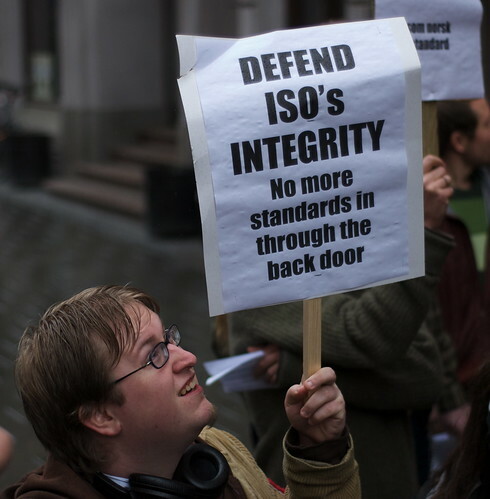 We are here because we want to defend ISO's integrity. 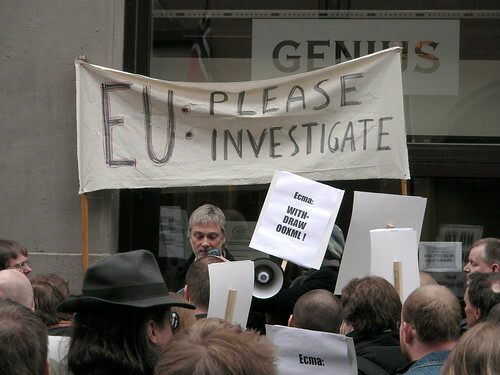 We are here because we want to draw attention to the scandalous behaviour of the people in Standard Norway whose job it is to represent Norwegian users and software vendors. And we are here because we want to prevent the adoption of a damaging IT standard in Norway. I will get back to this shortly. First I want to spend a few minutes explaining some background for the benefit of people who don't understand what this issue is all about. Please bear with me. This issue is all about documents - digital documents. It's about how we store documents and how we interchange documents with one another. I'm talking about the kind of documents many of you create every day: reports, letters, articles, school essays, books, theses, spreadsheets, and the like, using programs like Microsoft Word and Excel. But let us forget documents for a moment and talk instead about hair dryers. Let me show you an ordinary hair dryer, bought in a shop here in Norway. It has a plug. The plug has two pins. I can plug this hair dryer into any electricity socket anywhere in Norway. The reason I can do this is because all sockets are the same. There is a standard for sockets in Norway. The same standard is used in large parts of Europe and elsewhere: If I go to Denmark, I can take this hair dryer, plug it in, and it just works. I can do the same in Finland, Sweden, Germany and many other countries. I just plug it in and it works. But if I go to England, I can't just plug it in, because the sockets there are different. They have 3 square pins instead of 2 rounds ones. If I go to the US or Japan, I can't just plug it in, because their sockets are different again. They have 2 flat pins instead of 2 round ones. Documents are like hair dryers. We want to be able to plug them in to any piece of software and be able to work with them. But that's not how it is today. If you create a document in Microsoft Word and send it to someone else, that person cannot use it unless they also have Microsoft Word. People should not have to pay money to Microsoft in order to read my documents. The way things are at the moment, Microsoft effectively has control of the documents you and I create. Open standards can solve this problem, and that is why I believe in them. That is why I have spent the last 13 years representing Norway as a volunteer in a committee for international standards. I have worked with many standards, including SGML, XML and Topic Maps, and I have been Chairman of the Norwegian ISO committee since 1995. Two years ago, my committee approved an open standard for office documents called ODF. ODF was developed through an open and democratic process in an organization called OASIS. 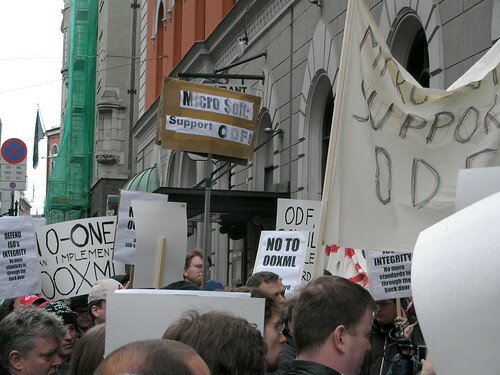 The purpose of ODF was to provide an alternative to what we call "proprietary" formats. Instead of document formats that are owned and controlled by a single vendor and that force you to use a particular piece of software, the ODF people wanted to define an open format that would make it possible to plug your documents into any piece of software. ODF was developed, as I said, through an open and democratic process. But one important player was absent from that process. The vendor who dominates this market, Microsoft, refused to participate, and they have refused to support ODF since it became a standard. Instead they decided to create a competing standard called OOXML and to use Ecma as a back door into ISO. We are not against OOXML itself. In fact, we thank Microsoft for finally after twenty years of market dominance documenting its format in an open specification. However, we are against ISO's approval of OOXML. The reason for this is simple: It is not in the interests of users like you and me to have two standards for the same purpose. It would be as if Microsoft were to come here and start installing sockets with 3 pins rather than 2, and then force us to buy their hair dryers. We are not against ISO either. What we are against is the way in which what has always been an open and democratic organization, where each country has one vote, has been subverted by a large multinational corporation. I do not hate Microsoft. I would like to welcome Microsoft into the standards community, but only if Microsoft abides by the rules and in particular the spirit of the standardization process. Microsoft has a bad reputation in the standards community. They are the Big Bad Wolf of standards, just like IBM was 20 years ago. But IBM has shown that it is possible to change. I hope that Microsoft too will change. I think it is possible. But it will only happen if we, the users, force them to change. Microsoft needs our help. We have to tell them to stop behaving like a bull in a china shop. They have to help them understand that standards work is about co-operation, not about conflict. Standards should not be created through warfare. They should be created through collaboration. Microsoft has a lot to learn, and it will take time. It will also take time for Microsoft to earn the trust of all those whose work they have sabotaged during the last twenty years. Microsoft now says that it now believes in open standards. They need to understand that it will take time before everyone really trusts them. They have to start showing less arrogance and more humility, and they have to prove in practice that they mean what they say. They can take the first step by admitting that they were wrong not to support ODF. I call on Microsoft to admit its mistake in trying to force OOXML through ISO's fast track procedure, and I call on them to support ODF. 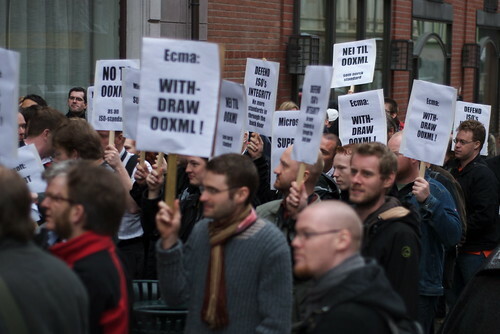 I call on Ecma to withdraw OOXML from ISO and keep control of it themselves. We need it for legacy documents. I call on Standard Norway to admit that it was wrong to overrule its own committee of experts and on them to change Norway's vote from Yes to No. 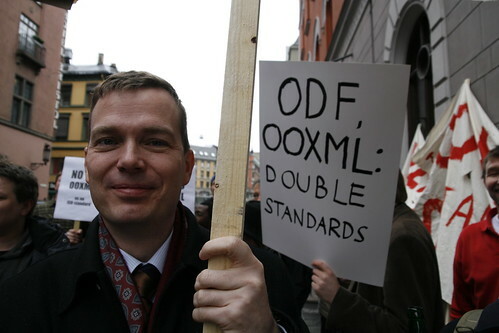 I call on the Norwegian Government to stand firm against Microsoft and not to approve OOXML as a Norwegian standard. Finally I call on users all around the world to look to Norway and follow the example we have set. Raise a storm of protest! Uncover the irregularities that have taken place in your country! Insist that your Governments change their vote to reflect the interests of ordinary people and not the interests of monopolists and bureaucrats. Kjære nordmenn, vi er ikke alene. 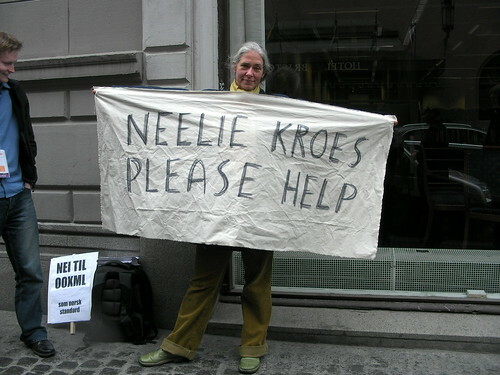 Dear Norwegians, we are not alone. Countries representing the majority of the world's population voted No to OOXML and for good reason. "The adoption of open standards by governments is a critical factor in building interoperable information systems which are open, accessible, fair, and which reinforce democratic culture and good governance practices"
ODF is an open standard developed by a technical committee within the OASIS consortium South Africa is amongst a growing number of National Governments who have adopted ODF over the past year. If it is successful, it is difficult to see how consumers will benefit from these two overlapping ISO standards. I would like to appeal to vendors to listen to the demands of consumers as well as Free Software developers. Please work together to produce interoperable document standards. The proliferation of multiple standards in this space is confusing and costly. Ms. Fraser-Moleketi: The people of Norway are with you, and we beg your forgiveness for the unacceptable behaviour of our standards bureaucracy. We were robbed of victory in ISO by a mere 3 votes. Without the irregularities in Norway, that would have been just 2 votes. Reports are coming in of similar irregularities in other countries, including France and Denmark. Let's get those non-representative votes changed. Let's throw OOXML out of ISO. Microsoft thinks it has won this battle, but I say it's not over yet. It’s never over until the fat lady sings, and this fat lady only just got started. 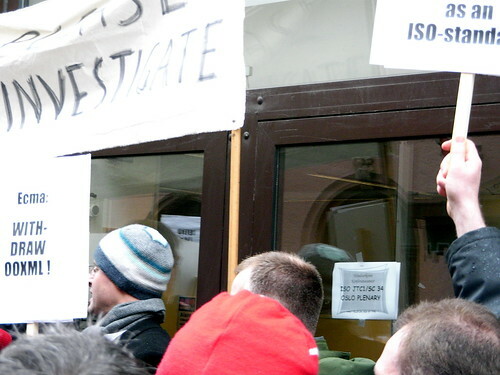 Re: OOXML triggers demonstration in Norway: "Let's throw OOXML out of ISO"